Susanna completed the MMus course in Vocal Studies at Trinity Laban Conservatoire of Music and Dance in 2012, gaining a distinction for her final recital. In July and August 2011, Susanna performed the role of Mlle Silberklang in Mozart’s opera buffa, Der Schauspieldirektor with Opera At Home at The Greenwich Playhouse Theatre and at the Arcola Theatre, for the Grimeborn Opera Festival. 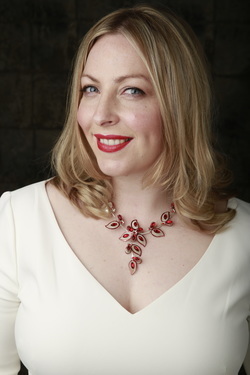 Susanna performed the title role in Puccini’s opera, Suor Angelica as part of the postgraduate opera scenes performance at Trinity Laban Conservatoire of Music and Dance in April 2012. Performances include the role of Donna Elvira in Mozart’s opera, Don Giovanni in the Masterclass at the Teatro Breno, Italy, the title role in Puccini's, Suor Angelica with The New London Opera Players, performing in Cardiff and London in August 2015. Susanna also be performed in The Chorus for Eugene Onegin and Fiddler on the Roof with Grange Park Opera, 2015. Susanna performed the title role in in Puccini's, "Suor Angelica" at The Abbey Theatre, St Albans on 7th May 2016. Future performances include, the role of Mimi in scenes from Puccini's, "La Boheme" with Opera Integra in July 2017. "Susanna Heard as Giulietta was affectionate and mature. Her aria in which she longs for Romeo – ‘Oh! quante volte’ – was desperately moving."